One of the latest gastronomic trends is set to transform Monaco’s Casino Square from 7th to 16th July, as Dinner in the Sky visits the Principality. While the adrenaline-inducing dining experience is not for the faint-hearted, the innovative new culinary treat will be enjoyed by 600 lucky diners from the Terraces of the Casino de Monte-Carlo and will offer stunning views over the Monte Carlo property for sale and the Mediterranean Sea. 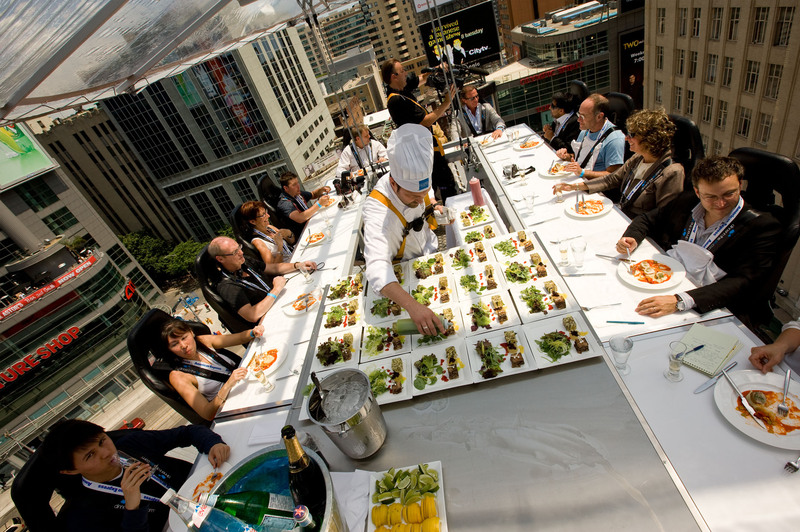 A once in a lifetime opportunity, dinner in the sky offers a truly memorable experience and combines culinary excellence with a unique form of entertainment. More than just fine dining, and better than the best of social events, the luxury gastronomic experience has been tried and tested in over 56 countries around the world. Up to 22 diners are hoisted 30m into the sky around a large table, where they are served sumptuous cuisine by talented chefs. How Much Does Dinner in the Sky Cost? Business Lunch: €600 (only lunch included). Lunch and dinner: €990 (includes private transfers, cocktail, gastronomic dinner and drinks). Lunch is daily at 12pm, while there are two dinner sittings each evening, 7:30pm and 10:00pm. Where is Dinner in the Sky Monte Carlo? This entry was posted in Dining in Monaco, Events in Monaco, General, Living in Monaco, To Do by La Costa Properties. Bookmark the permalink.